The Google app is responsible for a pretty staggering number of features ranging from the standard search interface, a voice assistant, and even a fully functional launcher. The latest update coming through the beta channel doesn't seem to have any new features going live quite yet, but there are a lot of changes to text and other resources, including the removal of all references to Bisto from the last teardown. Most of them are minor tweaks to features we've covered in the past, but a couple point to things we haven't explored yet. Users can look forward to pollen counts with their local weather and possibly a search bar located right in the notification shade. It looks like Google is testing a new location for the quick search bar. A new setting in the apk describes placing a "search bar in the notification panel." The setting doesn't appear to be live yet, even on the Android O developer preview, which isn't surprising since it's marked as a beta. Before you assume this is going to be just another quick access tile like the toggles for Bluetooth and Wi-Fi, let's be clear that the phrasing specifically says the search bar is in the notification panel and the word "tile" is never used. It could be worded incorrectly, which sometimes happens with unofficial features, but this sounds too specific to be a mistake. Since the Android OS only allows very limited access to the UI of a notification, this probably won't be implemented as a regular notification. Contrary to the point I made above, it obviously still could be a simple quick tile that displays a search bar floating on top of whatever screen you're currently looking at. I'm going to venture another theory or two, although I admit this is crossing deeper into guesswork. This clue might suggest Google is planning to modify the notification panel itself to include a space for the search bar, possibly inserting it between the quick settings tiles and the actual notifications. I'm not sure many people would want a search bar in that spot, but it's not implausible. 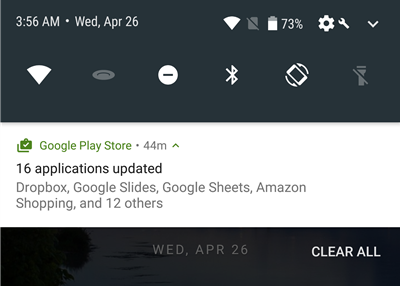 We can take that theory one step further, probably crossing into the realm of the unlikely, to raise the possibility Google could be planning to open up the notification panel to app developers even further and allow full-width widgets to be placed there. There are certain things that can't be done with either quick settings tiles or regular notifications, so there is at least some justification for adding this capability, but it still feels unlikely. We might find out more about this as Android O gets closer to launch. Regardless of the specific implementation method, we can return to the original question of whether or not most users would want a search bar in the notification panel. Would it be redundant if there could already be a search bar on their launcher and long-pressing on the Home button can open up Assistant, or would this just give us another option if those don't fit our workflow? Since it's a beta, we may not get much more about this for a while. In my neck of the woods, as with the rest of the northern hemisphere, we're in the middle of spring. That means we're enjoying warmer temperatures, sunnier skies, and longer days. For some, it's also time for unending fits of sneezing, itchy eyes, and all of the symptoms of hay fever. I don't personally suffer from this, but plenty of people do, and keeping tabs on the pollen count can be helpful for making plans to keep the allergies in check. Judging by a new image in the Google app, this information is about to get a little more visible. Titled ic_pollen_count.png, it's pretty clear what this flower image (that looks like it's sweating) will be used for. I expect it to show up with the standard weather predictions, much like it does on some other trackers and news outlets. It's a simple feature, but one that will surely be invaluable to millions of users around the world. Seeing as we're already in the middle of Spring, there's no better time for this information to go live, and probably could at any time. Hopefully it's sooner rather than later.